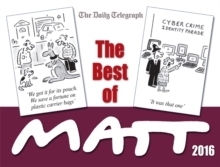 Matt is without doubt ‘that rare thing – a daily cartoonist who never fails’ The Times No matter what is happening in the world – from Brexit to bad weather, bemusing politics (on both sides of the Atlantic…) to mention Major Tim’s historic space walk – Matt will always put his inimitable spin on things and raise a smile. Nobody does it better! A Christmas must – this year, and every year.